Lucario can track a form of energy called an aura, given off by all living creatures. Lucario is the only known Fighting- and Steel-type Pokémon and evolves from Riolu during the day when its happiness is high enough. Lucario specializes in attacks that use aura energy, like Dark Pulse, and its can’t-miss move, Aura Sphere. Lucario cements itself as one of the most prominent offensive threats in the amiibo metagame thanks to its extremely high damage and knockback output. This is due to Lucario’s unique Aura mechanic, which increases the potency of its entire moveset when its own damage percentage increases. An injured Lucario is at its most dangerous, and depending on its Aura and Attack stat, an uncharged smash attack can finish off an opponent at around mid to high percentages. 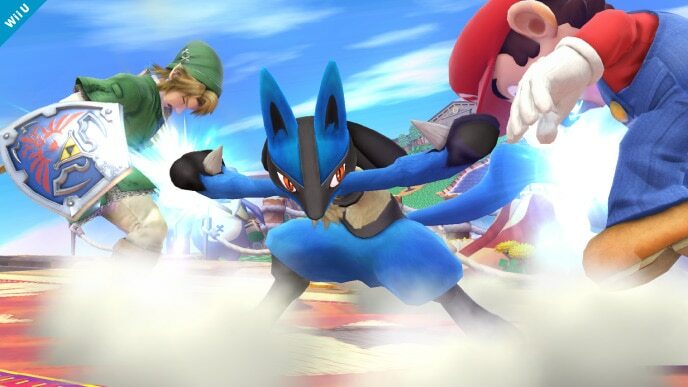 Speaking of smash attacks, Lucario has three powerful smashes that deal great damage, knockback, and shield pressure – they can even break full shields with proper timing! If a Lucario with high Aura gets a shield break and charges up a smash attack, a clean KO is almost always guaranteed. 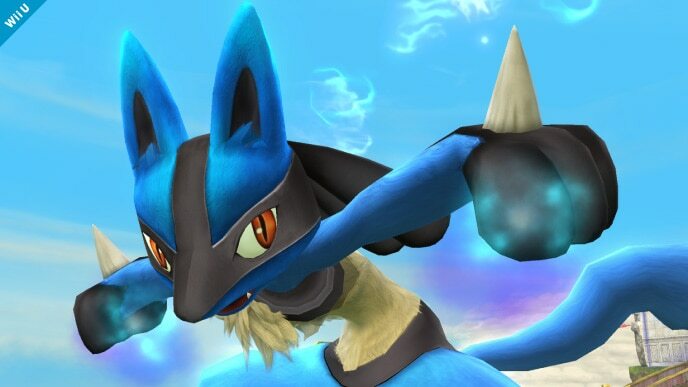 Lucario’s special moves have their uses, too – Force Palm, Lucario’s side special and arguably its best move, gains more range and power as Aura builds up and serves as the most reliable shield-breaking move in Lucario’s arsenal; Aura Sphere, Lucario’s only long-range projectile (but a great one at that), increases in size and strength as Aura itself increases. Along with those, Lucario has a great recovery in Extreme Speed, in which its distance increases depending on the Aura level, and a powerful counter in Double Team, though this can sometimes be difficult to land due to its somewhat sluggish retaliation speed. Finally, to complement its Aura, Lucario is classified as a heavyweight, aiding in its survivability to utilize Aura to its maximum capabilities. Lucario is not without its faults, though. While Aura helps Lucario nab KOs easier at high percentages, it sometimes works against Lucario – being at high percentages to boost Aura puts Lucario at risk of being KO’d itself. Powerful characters such as Ganondorf and Bowser can threaten and KO Lucario with their own strong set of smash attacks if Lucario cannot finish them off first, and Lucario may also find itself overwhelmed if a fighter with faster attacks, like Luigi or Mario, dodges Lucario’s attacks and gets in close. Lucario, more often than not, also finds itself having to rely on shield break punishes to hit with its smash attacks since all three of them are very slow on their own and can be tough to land, but breaking shields generally isn’t too much trouble for the Aura Pokémon. Lucario also has an unreliable command grab in Force Palm – though the grab itself is stronger than the blast, it has a very disappointing range, being located directly in Lucario’s palm. Not only that, but if Lucario actually manages to grab an opponent with this move, the foe has a huge chance of escaping if they’re equipped with Improved escapability (which they’ll most likely have, seeing as it’s the most common bonus effect run on tournament amiibo). And last but not least, Lucario has two notable AI issues – the first being that it has trouble charging up Aura Sphere, and the second is that it self-destructs with Extreme Speed, though the chances of this actually occurring are very rare. Thankfully, both of these problems can be remedied with proper training. Lucario is a prime example of a “high-risk, high-reward” amiibo – as its percentage and likelihood of being KO’d grows, so does its power and knockback, growing to a point where a fully-charged smash attack may as well be classified as a one-hit-KO, even on opponents at 0%. The reward outweighs the risk in most cases; due to this, Lucario should definitely not be underestimated as an opponent. It’ll still require some training to become a force to be reckoned with, but that’s why this guide exists: to help you with that training! For more information on equipment – including instructions on how to farm for custom parts – please read our amiibo equipment guide. Snaring Aura Sphere: A custom for Lucario’s neutral special. This custom travels slower than the default but sticks around for much longer and has a vacuum effect, sucking opponents in. Lucario’s default Aura Sphere is fine as-is, but if you want to give this custom a whirl, go ahead. 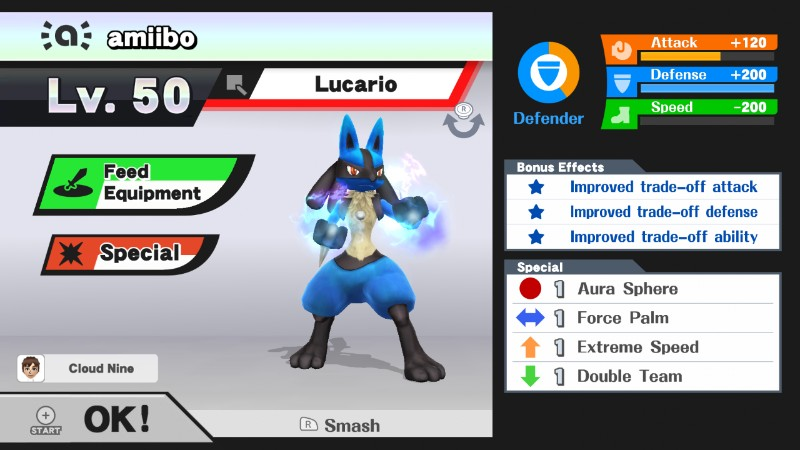 Glancing Counter: This custom for Lucario’s down special is considered inferior to the default – it doesn’t actually have a counter effect, but Lucario dodges automatically and retaliates back, even if it isn’t attacked. This is a niche choice; your amiibo could accidentally use its default counter in an undesirable situation, so fixing that problem up with an attack is a possible solution. Otherwise, stick with Double Team. Once your amiibo’s stats, bonuses, and custom moves are refined and ready to go, your training will officially begin! If you encountered a problem while equipping your amiibo, feel free to join our Discord server to ask for help. Amiibo training is a very specific task, and for the best possible result, you will need to approach it with caution. You can’t just go all-out using combos and aerials: both are seen as “newbie tactics” by competitive trainers. Instead, you should remain grounded at all times, making sure to punish your amiibo for every aerial attack it uses against you. This is true regardless of whether or not your amiibo was fed equipment. To help your amiibo properly utilize its moveset, you will mirror match it from Level 1 all the way to Level 50. Playing timed matches on Ω-form stages is highly recommended. Neutral options: forward tilt, up tilt, down tilt, and side special. Lucario’s side special is its best move thanks to its overall power and great range, and luckily for us, the amiibo can learn to spam and use it to great effect. Use this move a lot during training – it’s one of Lucario’s primary shield-breaking attacks. As for tilts, every one of them is a viable attack, since they each cover a specific area of range. Main KO moves: forward smash, up smash, down smash, and neutral special. 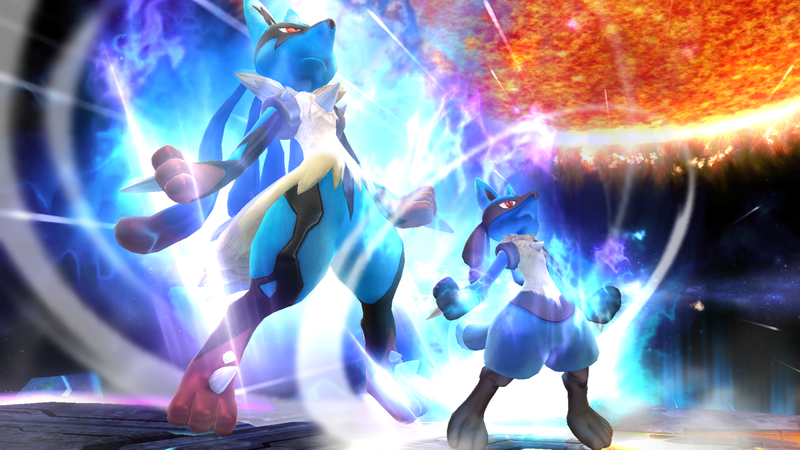 Lucario’s smash attacks, while slow, possess good strength and even greater power when Aura is in effect. If you manage to get a shield break on your amiibo, always charge up a forward smash. In any other situation, use forward smash as well, especially as an edgeguard – Lucario’s forward smash is great at catching opponents off the stage. Aura Sphere is another KO option – but since Lucario, like many other amiibo, have trouble fully charging moves, so always charge up to a full Aura Sphere before unleashing one (the same applies to Snaring Aura Sphere). Situational moves: down special. While not as good as the other counters in the metagame (such as Marth’s and Ike’s), Lucario can benefit from learning that it carries counter capabilities. Use this sparingly, preferably on Lucario’s slower attacks since they’re easier to telegraph. If your Lucario is packing the Glancing Counter custom, don’t bother using it that much, if at all – it’s inferior to Double Team and only serves to prevent your amiibo from using counters poorly in an unforgiving situation. If you did not feed your amiibo equipment, it’s a good idea to teach it to grab, pummel, and throw its opponents. When grabbing your amiibo, throw it towards the nearest edge. This means you will only need to use forward and back throws. In the equipment metagame, Improved escapability renders most grabs and throws useless. Without the presence of this bonus, your amiibo is free to use its grab as often as it pleases. When your amiibo finally reaches Level 50, its training will truly begin. Just like a real player, amiibo need match experience and practice against different characters. For more information on training your amiibo past Level 50, follow this link. Thank you so much for reading! Although the guide may be coming to an end, your training most certainly isn’t: there’s always a way to make an amiibo stronger, and yours is no exception. If you need additional help, check out the Amiibo Mechanics & Metagame Guide. If you want to ask specific questions, you can also stop by our Discord server. If your desire to read amiibo training guides and articles hasn’t been entirely fulfilled, there are more posts here that you might like. Amiibo Training Analysis analyzes a specific aspect of the metagame in great detail. Meanwhile, the official amiibo tier list ranks each amiibo’s potential. The FAQ is another good resource worth checking out. Alternatively, you can head back to the master list of guides for even more amiibo training methods! Thanks to Arklaine, Blakers, Kausonic, and LittleFang for compiling Lucario’s information. Images are courtesy of SmashWiki and the official Super Smash Bros. website.